I developed a bit of a love affair with the Jerusalem artichoke over the past season, and it continues on into the winter. Yesterday, I made a tuna salad wrap, using a peeled Jerusalem artichoke in place of the the celery I forgot at the grocery store. This had been in the vegetable drawer easily 2 months, and it was delicious. 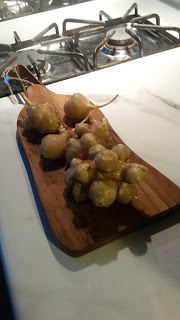 The Jerusalem artichoke was something new to me last year, when I friend bought some at Whole Foods and explained what they were. Shortly thereafter, another friend and avid gardener asked if I wanted some of his that were sprouting. He pulled his up because they were very popular with some of the wildlife in his area, making a mess of his garden digging up the tubers. What is a Jerusalem artichoke, or sunchoke? 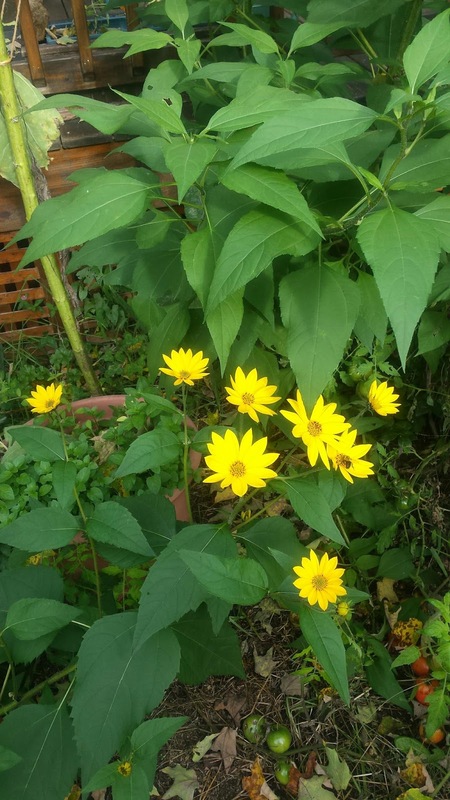 I am no expert, but these are a type of sunflower that grow many flowers--much like a daisy, and store food in a tuber or root throughout the season. The root will winter over and provide nourishment for the new flowers the following year, and produce more plants. In some ways it reminds me of an iris. 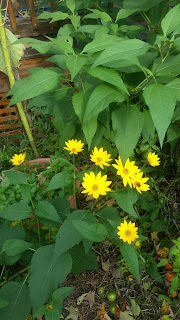 In addition to being one of the last veggies harvested in late November, it was also one of the last flowers standing. The Jerusalem artichoke can be eaten raw in salads, and has a flavor similar to a water chestnut, or can be boiled and eaten like a potato! One of the things that is most endearing about Maine is that things that require trust in the community, still exist--like this self serve vegetable stand about 3 miles from my home. One evening, about 8:30 PM I stopped in because the "Open" flag was flying. There was no one there, and the refrigerator had kale, carrots, beets and cucumbers. A price list was on the white board. The instructions near the cash box indicated that personal checks were accepted in the box, and if you wanted something but were a little short, you were welcome to take the item and return with the cash later!! In case you think this is an idealistic newcomer, the stand has been there for years. In addition, they are not alone--many people this summer had coolers at the end of their driveway with fresh eggs, and an envelope inside to put the cash in. 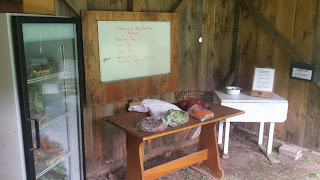 A small apple orchard on the Kennebunk/Lyman line sells cider, in season, from a self serve refrigerator in a small stand at the entrance to the orcherd. I would love to share that sense of trust and community with those who are unfamiliar and I'd like to think it is contagious, rather than something to be taken advantage of! If you take a look at the video on YouTube of this snowstorm scene you will see toward the end, two birds fly out of the birch tree, land on a sunflower stalk, and reach around to grab a seed. I was fascinated because there were several birds doing this for hours. I brought one sunflower in and roasted the seeds. They are delicious, but in the shell a great deal of work! Time races by and the summer seems like a distant but pleasant memory that slipped out of reach like a retreating tide. 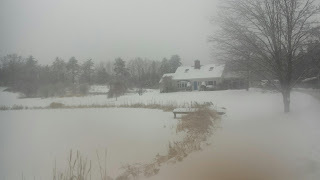 It is the time for opening a jar of relish made in the fall, butternut squash soup, adding another log to the wood stove, and watching the birds who have found the bowed heads of the sunflower stalks praying for Spring. 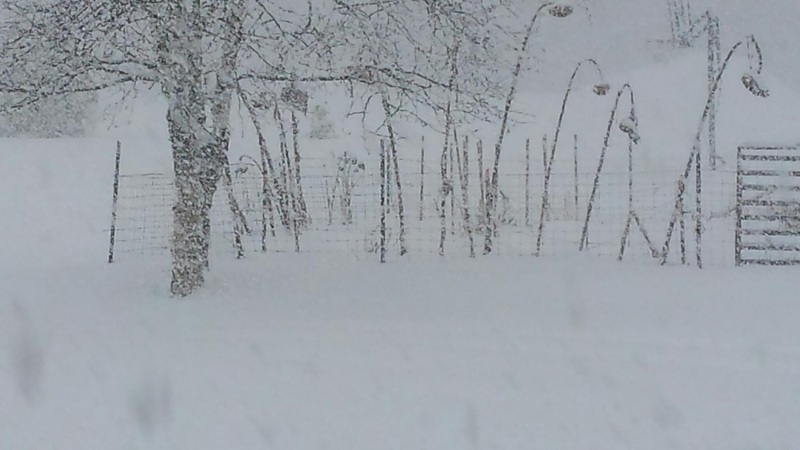 It is a time for dreaming and planning projects, praying that the snow blower starts, and marveling at the oasis of life in the barn, and the dried hay that keeps the creatures fed and warm, and smells of other seasons.